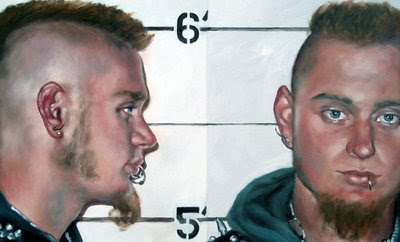 Suspect Profile #5 (detail), oil on birch panel, 24" x 36"
I'm pleased to announce that several paintings from my Suspect Profiles series will be included in a new exhibition entitled Face Time: The Portrait Under Investigation--a selection of contemporary portraiture by Sadko Hadzihasanovic, Timothy Laurin, Louise Noguchi, and Shannon Reynolds. The exhibition coincides with the opening of another fascinating exhibition called Arresting Images: Mugshots from the OPP Museum. This show features mugshots photographs from the late 19th and early 20th centuries was organized in commemoration of the 100th anniversary of the OPP. The two exhibitions should resonate very well together. Both shows open this Sunday, May 31, 2009 at the Art Gallery of Peel, in the Peel Heritage Complex in Brampton's historic downtown. Opening reception 1-4 pm. The invitation recommends people RSVP by May 22, so I guess I've made my announcement slightly late, but you could still try. Please contact me if you'd like more information. I shall tell all my Canadian friends, and hope to get there sometime myself.